The origins of the term juke or jook remain uncertain. Some scholars have speculated that the word derives from an African word, juga, meaning “bad” or “wicked,” while others believe juke comes from juice, often used to describe early electric guitars and music players (juice boxes). Whatever the term’s origins, juke joints remain important spaces for blues musicians and audiences. 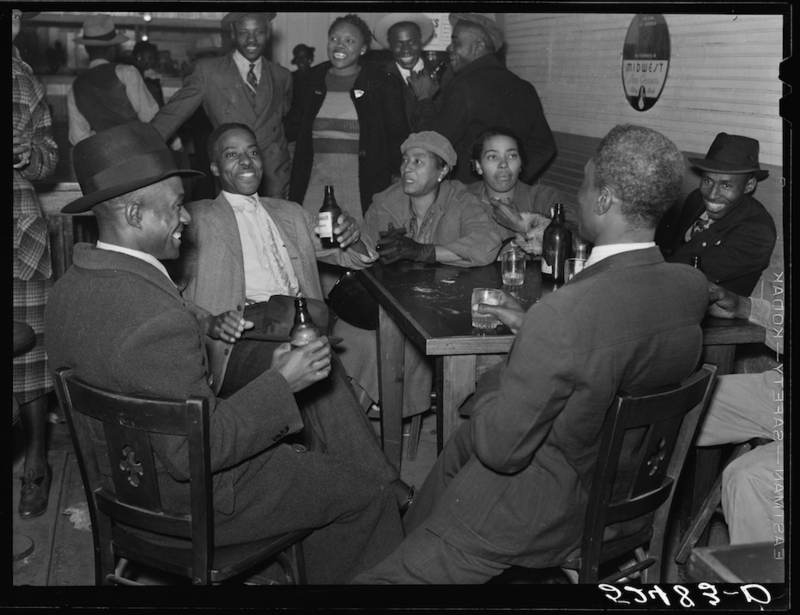 In 1934 Zora Neale Hurston wrote that “musically speaking, the Jook is the most important place in America.” Spatially speaking, juke joints are difficult to define, because they are a conceptual space rather than a template. The earliest juke joints were defined by the live blues music played there, whether the site was an abandoned sharecropper shack, an open field, or someone’s home. Juke joints are never built; rather, they appropriate previous spaces. The buildings adapted for juke joints have different layouts and definitions, but juke joints carry certain elements that redefine the previous space. Almost all contemporary juke joints contain a bar of some sort (even if it consists only of a few cases of beer and a garbage can full of ice), a pool table, a stage area, seats for patrons, and colorful decorations. The interior walls often are roughly painted with scenes of celebration (people drinking, dancing, and singing) or with idyllic pictures of paradise (palm trees and islands). Celebratory decorations of various kinds adorn the walls—Happy Birthday signs, Christmas lights, confetti and tinsel. Juke joints need only the lowest common denominators of celebration, relying on basic decorations and design elements like the bar to establish itself. The malleability of juke joints developed out of the subversive nature of early blues music itself. During slavery, African Americans were not permitted to gather; in some cases, dancing and singing also were not allowed. Despite these constraints, music played an important role in the development of the African American community. 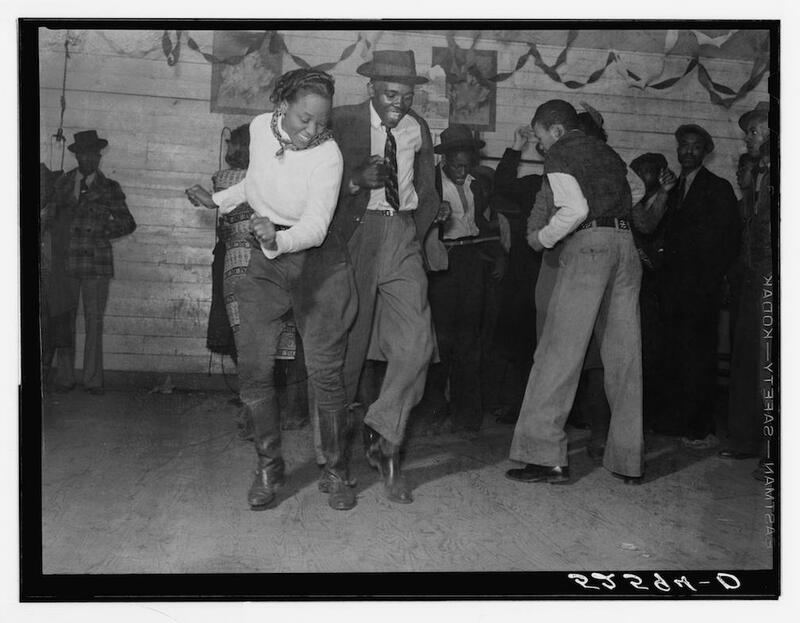 As blues music gained popularity in the Jim Crow South, juke joints became safe places for African Americans to gather without white supervision. The basic principles that kept juke joints covert during segregation have become the defining elements of juke joints since that time. Juke joints are not simply a rural phenomenon, although even in towns and cities they tend to serve an established community. Unlike a club or bar, patrons at a particular juke joint tend to know each other. This lack of anonymity was certainly necessary to ensure safety under Jim Crow and remains a fundamental principle of modern juke joints. Certain elements that are a given for other businesses are often lacking at juke joints, such as set hours of operation or public phone numbers. Instead, juke joints tend to run when musicians are available to play, with notice of a performance spreading through community networks rather than via official advertising. News of a performance depends on the path of information already established within a given community, reaffirming the familiarity of the crowd that attends a particular juke joint. As a result, some prior knowledge of the juke’s existence and possible operating hours is required. This does not mean newcomers are not allowed: those who are willing to talk to local citizens about attending juke joints will most often be welcome. While juke joints tend to serve a specific core group of people, they are not private functions. Patrons must often pay to enter, and liquor and food are frequently sold. Still, juke joints tend not to be moneymaking endeavors for the proprietors, and almost all proprietors hold full-time jobs. Unlike a party, juke patrons pay for food and drinks, and musicians are paid—albeit minimally—from the money raised. In Mississippi and much of the rest of the South, proprietors are supposed to purchase juke joint licenses from the state. 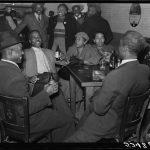 Defining a juke joint has less to do with the decoration or style of the space and more to do with the interaction between the crowd and the music. Live music is no longer an absolute, as many juke joints employ deejays or house jukeboxes, but the lack of anonymity among the crowd at a juke joint remains one of the elements that distinguishes it from a club. Juke joints are a function of blues, and the physical spaces mimic the metaphorical in many ways. The call-and-response nature of blues, for example, can be seen in the interaction required of juke joints. Unlike clubs or bars, juke joints rely on an atmosphere of familiarity among the patrons, proprietors, and musicians. The communal nature of blues music also imprints the space. Just as any given blues tune can have an infinite number of lyrics or chords, particular design or decorative principles do not bind the spaces. 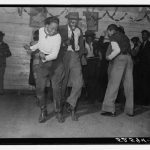 The Mississippi Blues Trail has identified numerous past and present juke joints, and the establishments remain important both to local blues fans and to traveling enthusiasts. Photographers and filmmakers have long found—and continue to find—juke joints to be subjects of great beauty and intrigue.